Sub: Grant of Fixed Medical Allowance to Central Government Civil Pensioners residing in areas not covered under Central Government Health Scheme – reg. a) An undertaking in the prescribed format. 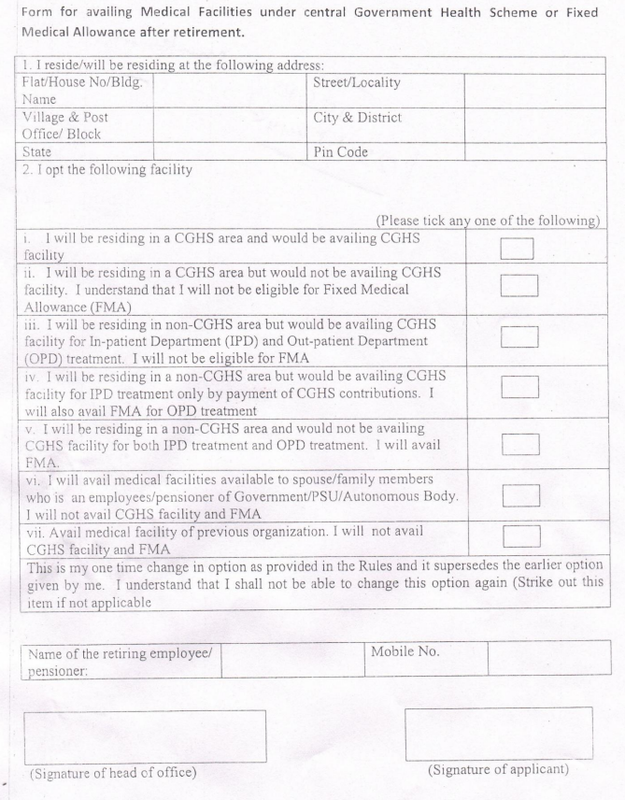 b) A certificate from the Medical Authorities of CGHS or from authorities of corresponding Health Schemes of the concerned Ministries/Departments, as the case may be, that the area where the pensioner is residing is not served by any dispensary under CGHS or the corresponding Health Scheme administered by the Ministry/Department. 2. Keeping in view the difficulties being faced by the pensioners in obtaining the required certificate from the concerned Medical Authorities, the matter has been reconsidered in consultation with the Ministry of Health and Family Welfare. It has now been decided that the pensioners, residing in areas not covered by CGHS or any corresponding Health Schemes administered by other Ministries/Departments, as the case may be, would no longer be required to submit a certificate referred to in para 1 (b) above. I _______, a retired employee of _____ (Office Address) _________ declare that I am residing at (Residential Address indicated in PPO) , which area is not covered under CGHS or any corresponding Health Scheme administered by the Ministry/Department of , (as the case may be). I have also not obtained and do not wish to obtain a CGHS Card for availing out-door facilities under CGHS/Corresponding Health Scheme of other Ministries/Departments from any dispensary situated in an adjoining area. 4. All the pension disbursing authorities are required to obtain the above undertaking along with the Form, as mentioned in Para 3 above, from such pensioners before sanctioning Fixed Medical Allowance. An entry to this effect should also be made in their PPOs.